Last time, I took a look at two more of the cards in the cycle of Instant Multicolor Commons from Fate Reforged. Today I want to finish with the last two cards in the cycle and offer my evaluation of them. And again, in the interest of full disclosure, I am offering my review of these cards after listening to Episode 266 of Limited Resources, where this cycle was reviewed as the show's official preview cards. This card immediately brings to mind one of the more powerful Commons to see print: Corrupt. 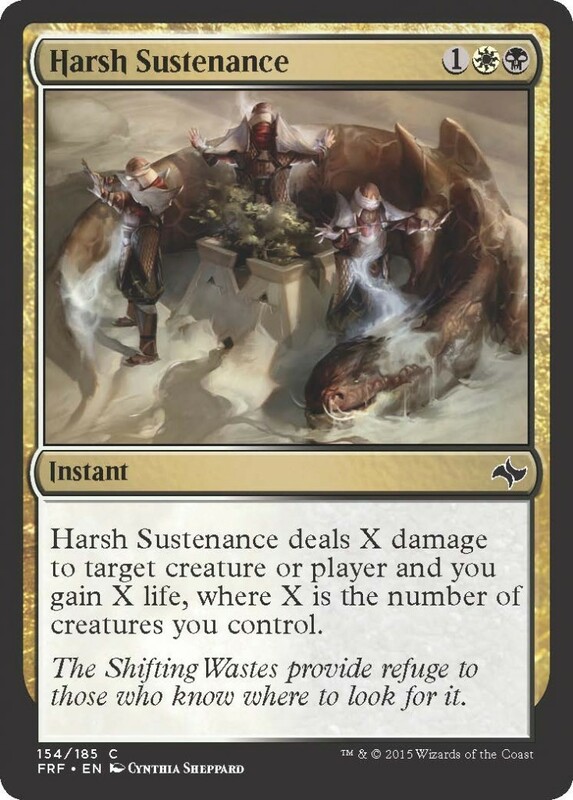 Harsh Sustenance is cheaper, and Instant speed instead of Sorcery, but relies on the number of creatures you have in play rather than the number of Swamps. Even with only three creatures in play, this is the equivalent of Lightning Helix, another extremely powerful card. It's quite strong in a board stall situation, or when swinging in for an alpha strike, and particular strong in any sort of tokens strategy. Granted, it does nothing if you have no creatures in play; your opponent can also destroy your creatures in response. But this card is very strong, and will definitely see widespread play. 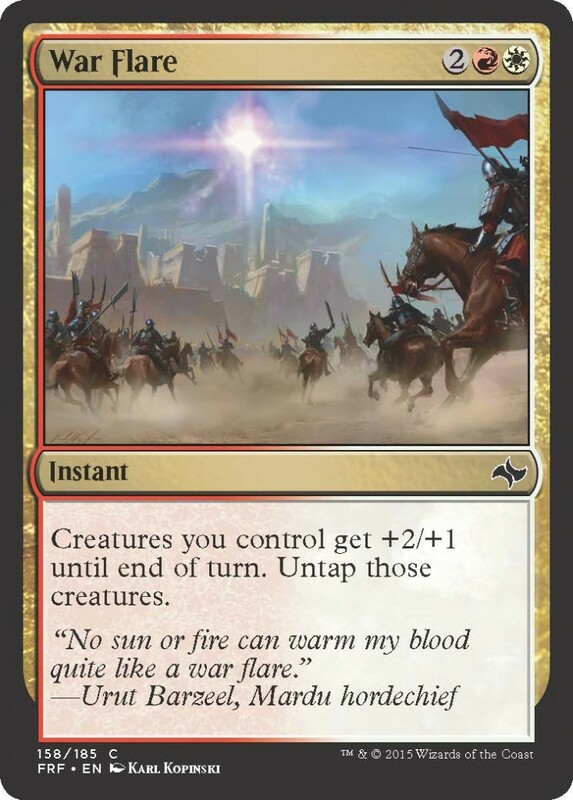 War Flare is also strikingly similar to another card - in this case, Inspired Charge, which was recently printed again in Magic 2015. However, ignoring mana costs, this is strictly better, since it also untaps all of your creatures, making this useful on both offense and defense. There has been a dramatic increase in the number of tokens at Common in both Red and White, and obviously this card would be quite powerful in that sort of strategy. In a board stall, it allows you to swing in freely, knowing that even if you don't finish off your opponent, your creatures will still be able to block on your opponent's turn. It's a bit expensive as a combat trick though, so it will probably only see play in decks specifically designed for it. Taken as a whole, this is a very powerful cycle of cards at Common. Given the design constraints of New World Order, you can clearly see that these cards were "pushed" to retain this level of power and/or complexity at Common. While requiring two colors does constrain them somewhat, the availability of easy fixing at Common should allow them to see widespread play. 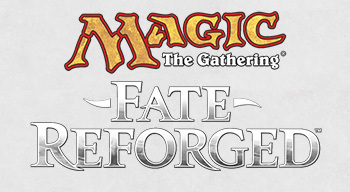 I anticipate this cycle will have a strong impact on the Standard Pauper metagame after the release of Fate Reforged. What do you think of this cycle? Let me know in the comments below. I think it's nice that they pushed the complexity a little. I agree with you: Harsh Sustenance is a powerhouse, and it serves a wide variety of decks. I dare to say it may be the strongest common in the set. I also think the "fight" one is good. 3 mana instant removal is something I miss a lot.